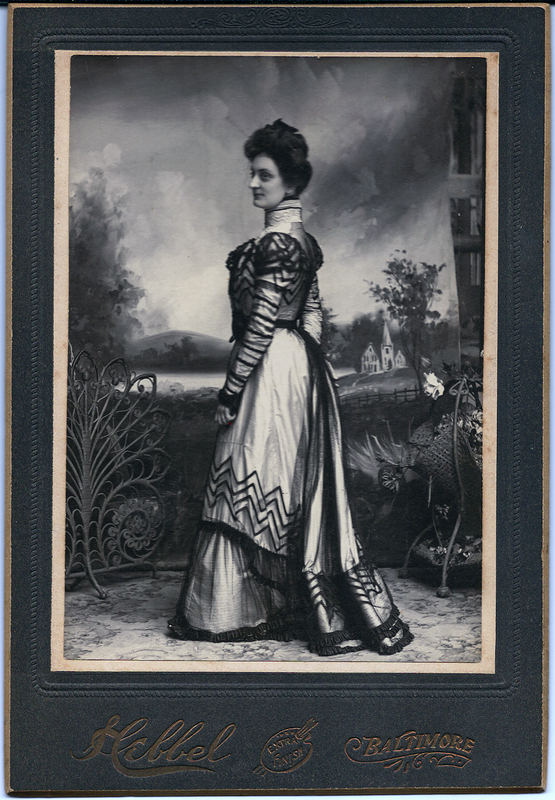 Inscribed “Yours Very Sincerely, Agnes Blass, taken July 1902, to Mrs. G. Sander,” this busy, slightly over-sized cabinet card portrait looks much more back to the 19th century than it does forward to the 20th. Although attempting to highlight the subject’s rather striking gown, the Julius Hebbel studio operator overwhelmed the dress with clutter representing some of the 1880s’ typical props: a sentimental rural landscape backdrop (the visible edge of which reveals the studio’s “back stage”), artificial flowers and Hebbel’s ubiquitous Victorian wicker screen. Miss Blass is posed in profile to highlight the ornamentation on the gown’s filmy overskirt and small gathered train, but somehow the lighting has produced a deep shadow that makes the young women look as if she has a black eye. Louisa Agness Blass was born 1 December 1872 in Washington County, Ohio to Bavarian immigrants Jacob Blass (1834-1890) and Catherine (Barthell) Blass (1835-1920). Jacob Blass was apparently a pastor of the German Reformed church who served congregations in Baltimore, Pennsylvania and Indiana, including St. John’s Evangelical Lutheran and Reformed Church in Erie, Pa., Emmanuel Church (now part of the United Church of Christ) in Meadville, Pa., and St. John’s Evangelical Church, Evansville, Ind. A 1901 Baltimore Sun article on the 50th anniversary of the “First German United Evangelical Lutheran Church” noted Jacob Blass as a former pastor, and said the church was located on Eastern Avenue near Broadway, but this may not be accurate. The Blasses lived in the Canton neighborhood of Baltimore in 1880. There is an Evangelical United Church of Christ at Dillon Street and S. East Avenue in Canton, but it’s unclear whether this congregation has any relation to the one served by Blass. Agness and her mother made their home with Agness’ brother, Reverend Julius Blass (1861-1902). According to a family history researcher on Ancestry.com, Agness became the second wife of Erie, Pa. cigar manufacturer Henry Mueller and step-mother to Henry’s daughter Thelma Mueller. Reverend Julius Blass was ordained as a Unitarian minister in 1882 after studying at the Meadville Theological School, Meadville, Pa.. He died on 5 April 1902 in Baltimore (Baltimore Sun, 6 April 1902). Agness’ brother John Henry Blass became a pharmacist, and in 1902 kept a drug store at 410 N. Gay Street, next door to the Hebbel Studio at 409 N. Gay Street, so having her portrait taken there would have been quite convenient. Jacob Blass, Catherine Blass and Julius Blass are buried in Erie Cemetery, Erie, Pa. The funeral directors H. Sander and Sons were charged with conveying the Reverend Julius Blass’ remains back to Erie, Pa. for burial. Agness Blass presented this portrait to “Mrs. G. Sander,” who likely was the wife of George A. Sander, Henry Sander’s son and a member of the family firm.